Adult males are slimmer and may show more red in their fins than the females. These fish are difficult to breed in captivity. Would do well in a pygmy community tank, but do not keep with fish that could swallow this little fish! Would do well with small Tetras, Rasboras and dwarf Corydoras. Not strictly a shoaling fish, but keep in groups of 3-4 or more. Omnivores, will take most small foods including crushed flakes or pellets, and small live foods such as daphnia and brine shrimp. 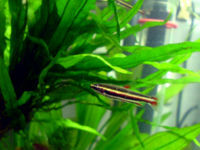 Prefers a well planted mature tank with good filtration, but not a strong current. They do not appreciate very bright lighting so floating plants are desirable. Doesn't need to be shoals, but prefers company of 3 or more. A peaceful mid-swimming fish. This fish has two bold horizontal black lines with two white lines accompanying. Red and some yellow on the fins with hints through the body.